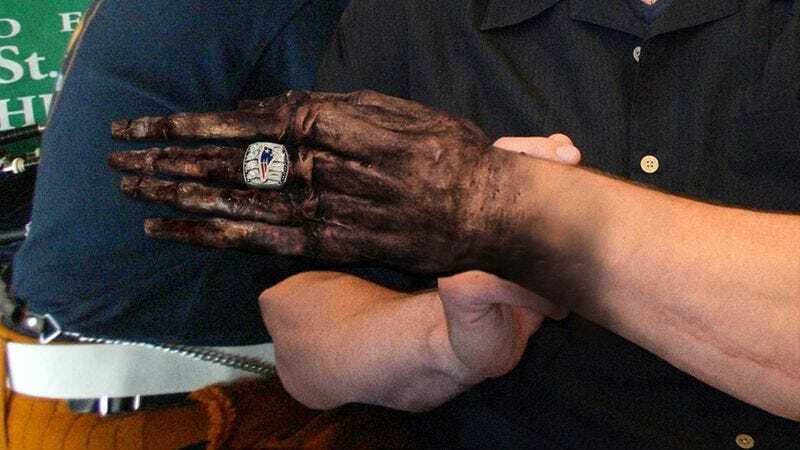 CHESTNUT HILL, MA—Moments after receiving their Super Bowl XLIX championship rings at team owner Robert Kraft’s home earlier this week, sources confirmed that New England Patriots players and coaches were horrified to find that the rings caused their fingers to instantly shrivel up and turn black. “Oh my God!” a horrified Julian Edelman screamed moments after slipping on the diamond-encrusted band, which immediately turned his ring finger into a shrunken, dried husk of charcoal flesh as spider-like tendrils of black rot rapidly spread up the wide receiver’s arm. “It’s burning me! It’s so hot! Wait, it’s—it’s not coming off! Oh, God, it’s not coming off! Help! Please help me!” At press time, as his players shrieked and clutched at their ashen, mutating arms, head coach Bill Belichick donned all four of his Super Bowl rings and could be observed cackling madly as he began levitating several feet above the ground.